The world of J. R. R. Tolkien is filled with strange creatures, elaborately crafted lore, ancient tongues, and magic that exists only in fantasy; yet the lessons taught by hobbits and wizards speak powerfully and practically to our real lives. Courage, valor, trust, pride, greed, and jealousy--these are not fictional virtues. This is the stuff of real life, the Christian life. 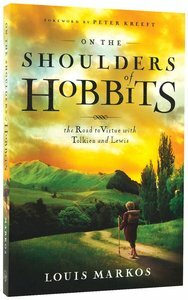 Professor and author Louis Markos takes us on the road with Tolkien and C. S. Lewis, with looks at selected classic works of literature as well, to show how great stories bring us so much more than entertainment. They inspire and convict, imparting truth in unforgettable ways. About "On the Shoulders of Hobbits"
He has published extensively in periodicals such as Christian Research Journal, Christianity Today, Touchstone, Christian Scholar's Review and Theology Today. Markos has spoken widely all over the US and Oxford. He is also a culture critic.